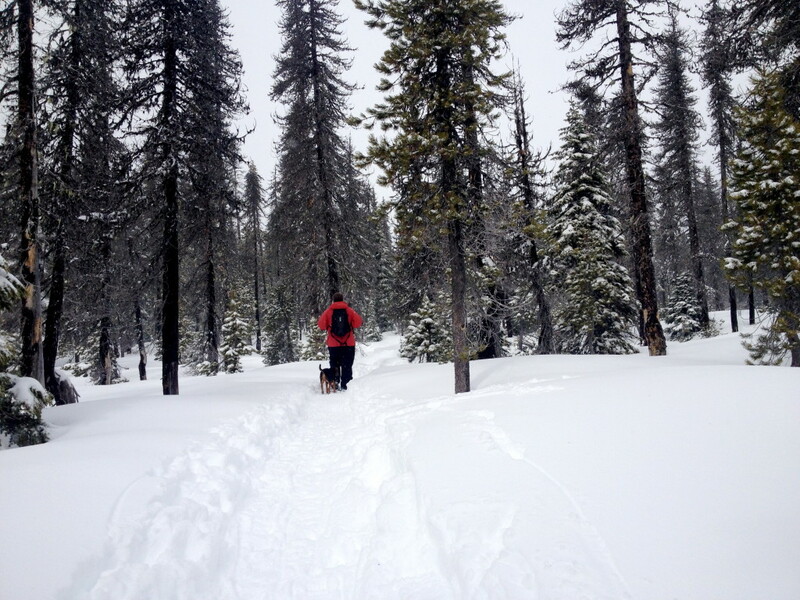 I snowshoed to Pip’s Donuts during our big snow storm a couple weeks ago and I caught the snowshoeing bug. My dog and I had so much fun plodding through my neighborhood we decided to do it again. So this weekend headed up to Mt. Hood. 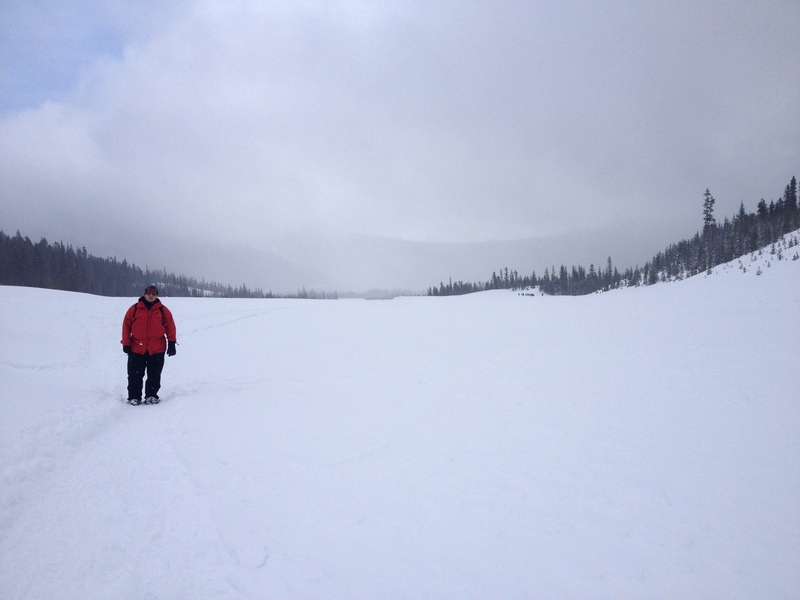 A couple years ago we had snowshoed Mirror Lake which is a great trip, except for the parking. You have to park a mile up the highway and walk to the trail. Very time consuming and annoying. Anyway, this time we decided to try White River, it’s a further drive, but it has a parking lot and I had a few people recommend it. So White River it is! White River is pretty crowded with sledders. The first quarter mile of our hike were were dodging small kids, navigating other past loose dogs, and fighting to get through the crowd, then before we knew it… we were ALONE. 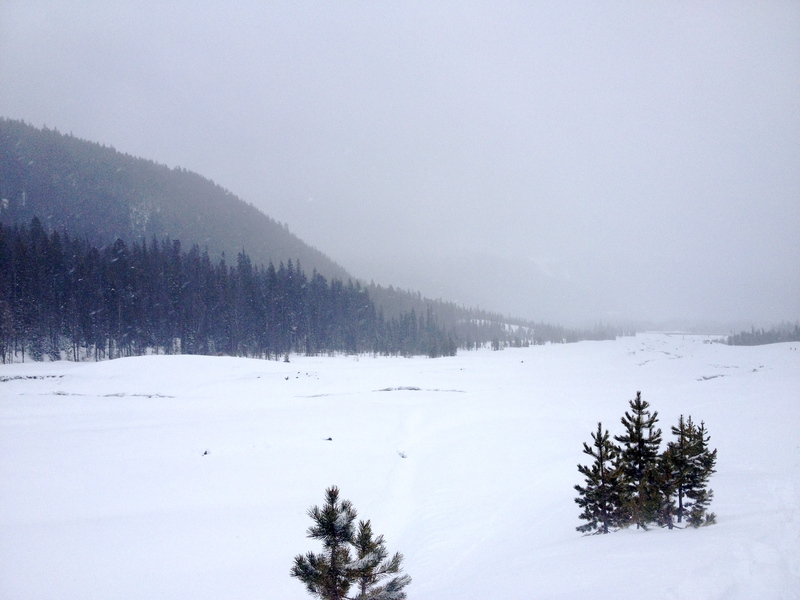 With the crowds in our rearview, we let the dog free, bundled up and pushed up the canyon into the blowing snow. Other than one short steep hill it was all a slow gentle uphill grade. It was snowing and a little windy for the first half hour then the conditions cleared and the sun even came out. What I love about shoeshoeing is that anyone can do it. It’s just hiking with really big shoes on. Since this is a popular trail there was an easy-to-see track to follow. 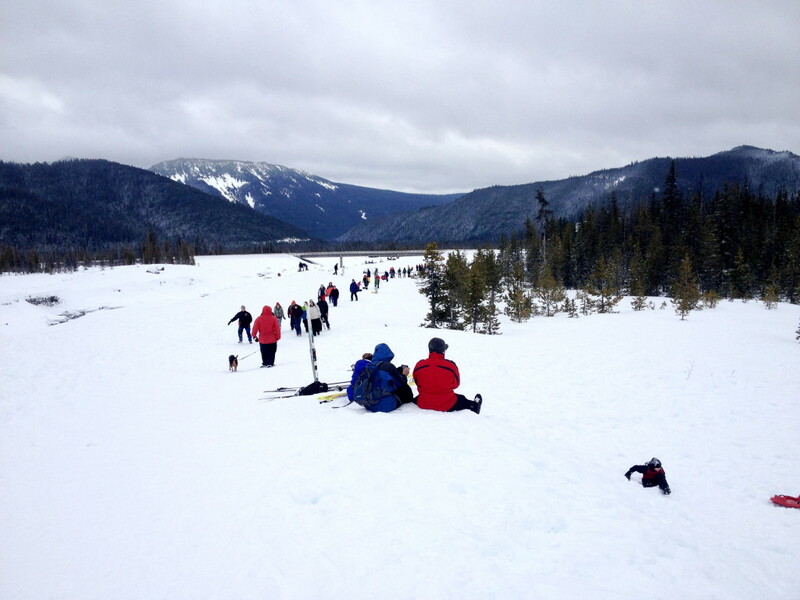 We walked for about an hour up the canyon passing a handful of skiers and a few other snoweshoers. 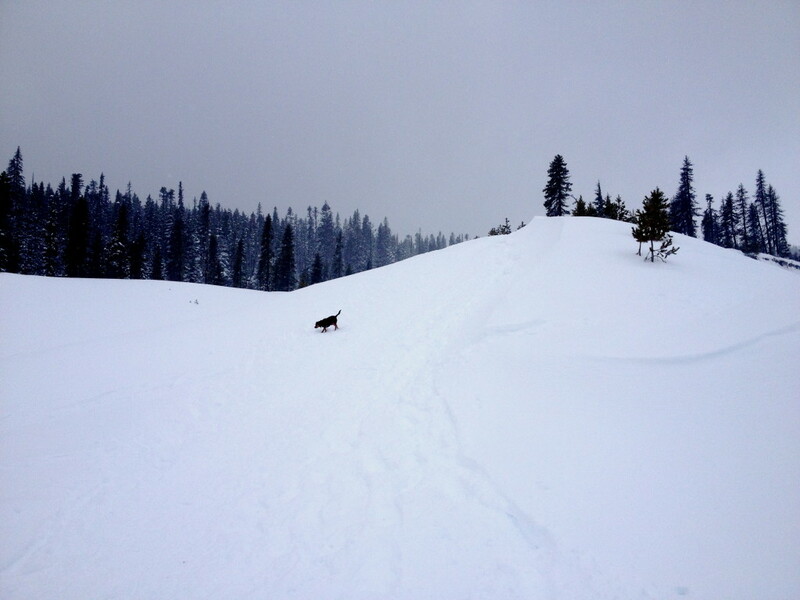 You could easily go off trail a and not get lost since you are right next to a river, but we had Mr. Spike with us and the snow was a little deep for him. He LOVED it though. He is a total snow dog, obviously takes after his mother (me). We headed back after about an hour. We probably could have gone further but we didn’t want the dog to get too cold. I’m sure he would have been fine since he kept leaping into snow banks, but his humans chickened out. The trip back was fast and easy since it was all downhill. 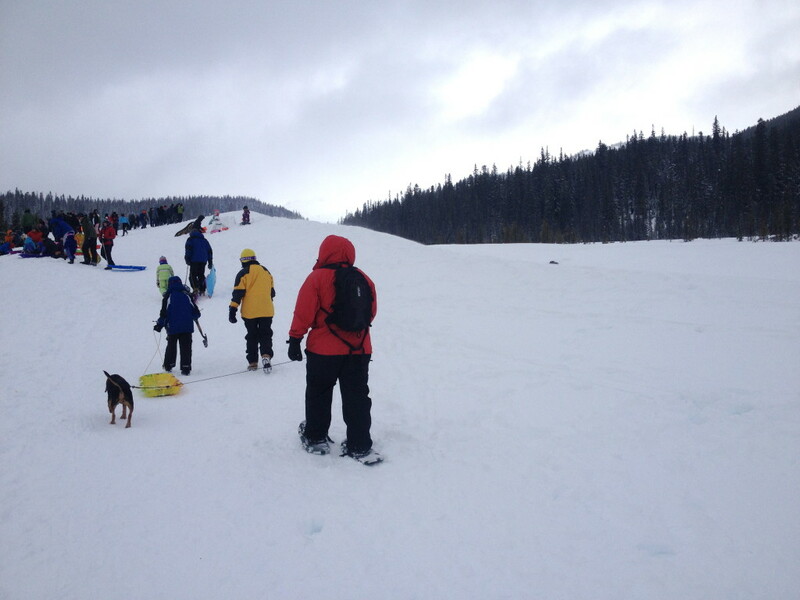 And by the time we made it back to the main park, the sledding crowd had grown even bigger. I love seeing people play in the snow. Adults, kids, animals everyone loves it! So how do you get to White River? If you’re coming from Portland drive up Hwy 26 past Government Camp and Timberline Lodge. Take the Hwy 35 turn off as if you are heading towards Mt. Hood Meadows. The Sno-Park will be on the left right before you cross the bridge. If you cross a bridge, you’ve gone too far. And don’t forget, you need a Sno-Park permit. You can pick them up in Sandy or Government Camp. Happy treking! 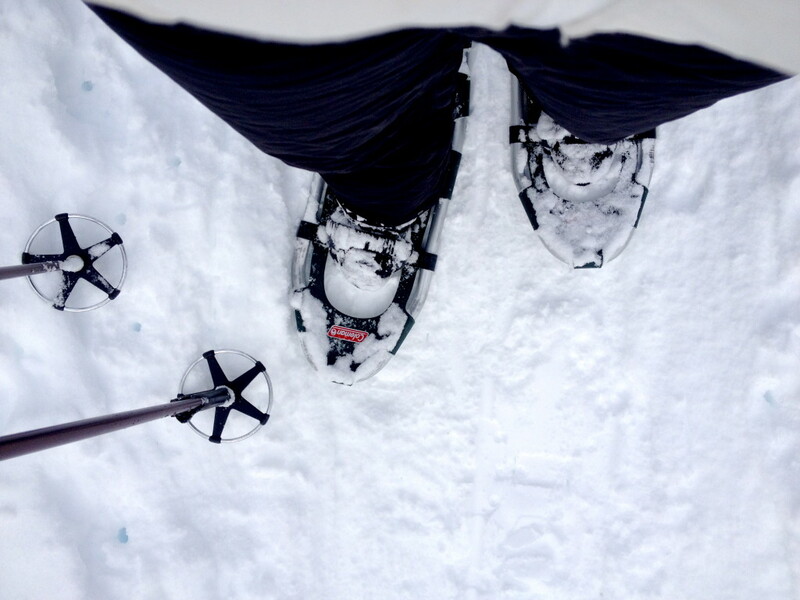 Please let me know if you give it a try or if you have any other hot snowshoeing tips.